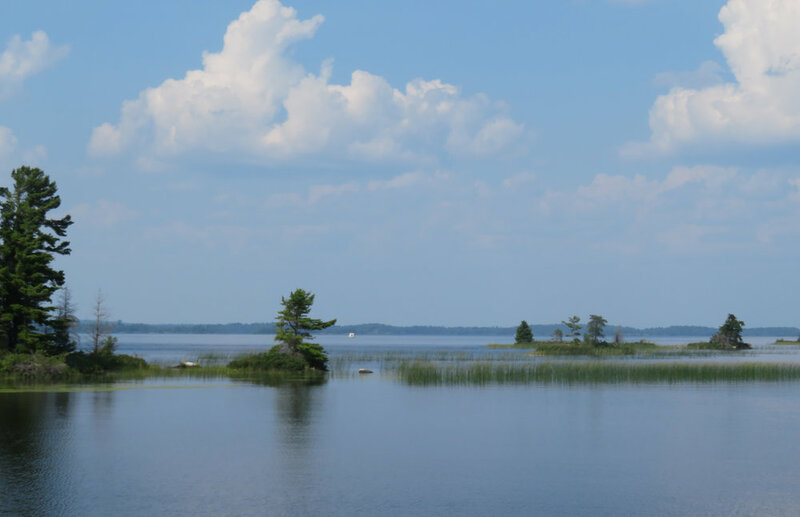 Voyageur National Park only offers boat-accessible camping and thus we chose our campsite at the City Beach Campground on the shores of Rainy Lake in nearby International Falls. The campground was reserved for tent camping, but the kindly camp host told us that our screen house would suffice. We needed to pitch it for the first time. Let’s label this activity ‘Keystone Cops Do Camping’. It’s a Coleman ‘instant-up’ type, but it wasn’t quite as ‘instant’ as we’d imagined. We erected it inside out the first time … or was that outside-in? No matter … we finally decided to read the directions and the set-up ended up being quite easy. It offered short-term entertainment for other campers and provided very nice protection when the mosquitoes descended at dusk. We woke to the sound of loons in the morning. Their calls … wails, hoots, tremolos and yodels … are wonderfully eerie. As I walked to the lake shore to get a better look at the loons, I spotted a raft of juvenile mergansers all following a female. I’d just read about this in a local newspaper … ‘Some birds, including common mergansers and ostriches, raise their babies in a day care system that’s called a crèche, experts say. In a crèche, females leave their ducklings in the care of one female — often an older female who is experienced at raising babies, said David Rave, an area wildlife manager who oversees the Bemidji region for the Minnesota Department of Natural Resources. The females, many of which are related, lay eggs that hatch around the same time, he said. Afterward, the adult ducks go off to molt their feathers, leaving their broods in the care of a matriarchal female.’ Who knew? After our canoeing experience of the previous day, we were returning to Voyageurs National Park once again. 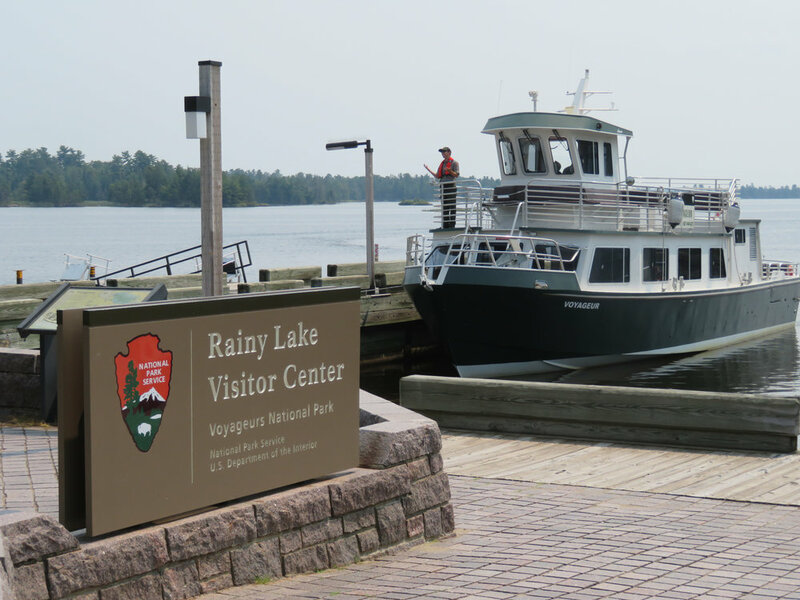 Today, I’d made reservations for a boat tour on Rainy Lake. Someone else was captaining the vessel and since we were neither paddling nor steering, we felt fairly secure that we’d stay dry and escape any major catastrophes. We arrived at the park in dry clothes and fake mustaches in hopes the staff wouldn’t recognize us. The lake is vast and beautiful, made even more gorgeous on a brilliant, dazzling sunny day. As we boarded the ‘Voyageur’, there was Eric the Ranger, our guide for the day. He acknowledged us with a wave and smile and we noted that throughout the boat trip wherever we were, there was Eric, keeping an eye on us. He wasn’t taking any chances. The highlight of the trip was spotting the bird life … cormorants, loons, mergansers, gulls. 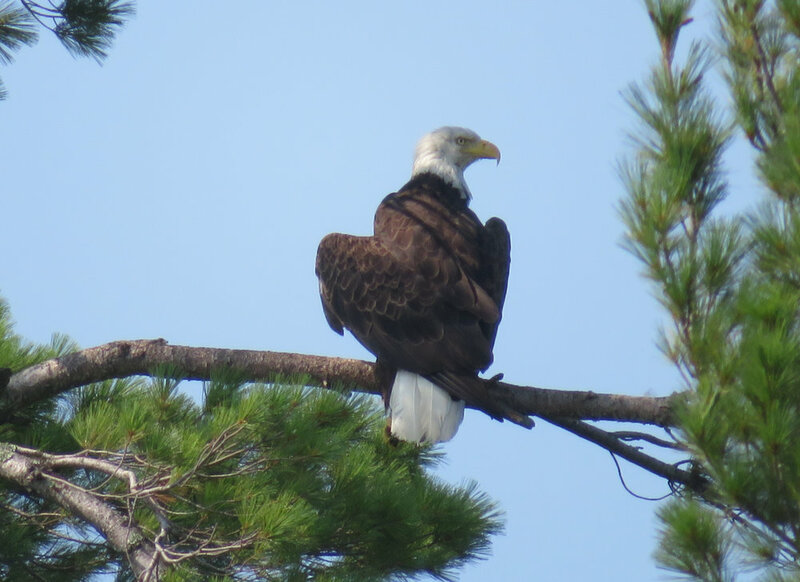 Bald eagles, however, stole the show. We spotted them high on tree branches as we slowly passed the small wooded islands and islets that dot the lake. The views were spectacular and for a moment, just a brief moment, we kind of missed being on the water. Then we thought about boat repair and maintenance and anchor watches and storms and weather windows … and decided a boat trip once in awhile was lovely. As we disembarked and made our way out of the park’s visitors’ center, we heard one ranger call after us “Stay dry!”. Since we only had a few days to drive to Britt, Iowa for the 118th Annual Hobo Convention, we opted to drive a few hours after the boat trip to clock a few miles. Minnesota probably has the market cornered on ‘big’ roadside statues. You remember Paul Bunyan and Babe from Bemidji? 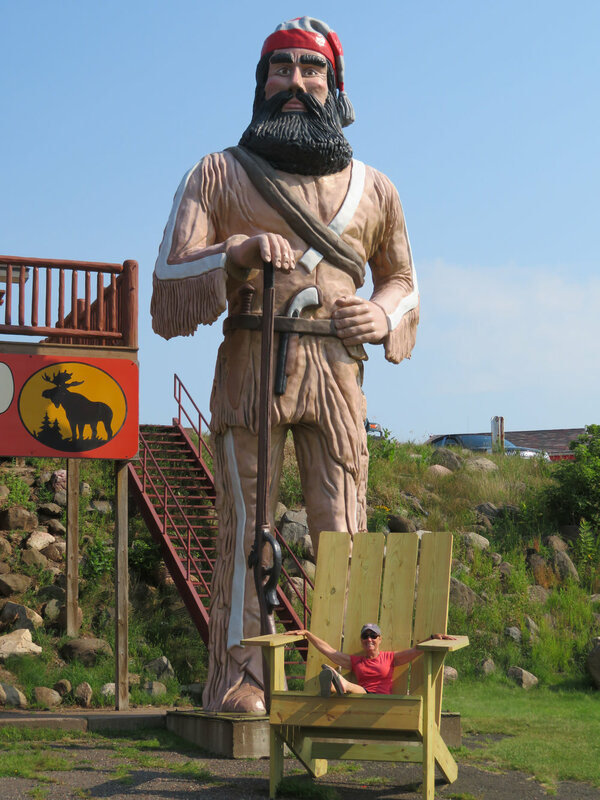 Well, along the highway in Ranier on the way to Voyageurs NP, we met Big Vic, a 30’ tall voyageur. We also had lunch in Smokey Bear Park one afternoon. The sign indicated that 26’ tall Smokey was the largest Smokey statue in the USA. Since Smokey is an ad campaign for the US Forest Service and probably not a big deal in other countries, I concluded that this Smokey might actually be the largest Smokey in the whole world … and, to think, we had lunch with him. Not far away, a larger than life Bronko Nagurski statue stood outside the Bronko Nagurski Museum. Further down the road in Barnum, MN, we met up with Big Vic’s brother, Big Louie, who stands outside the Lazy Bear Cafe. 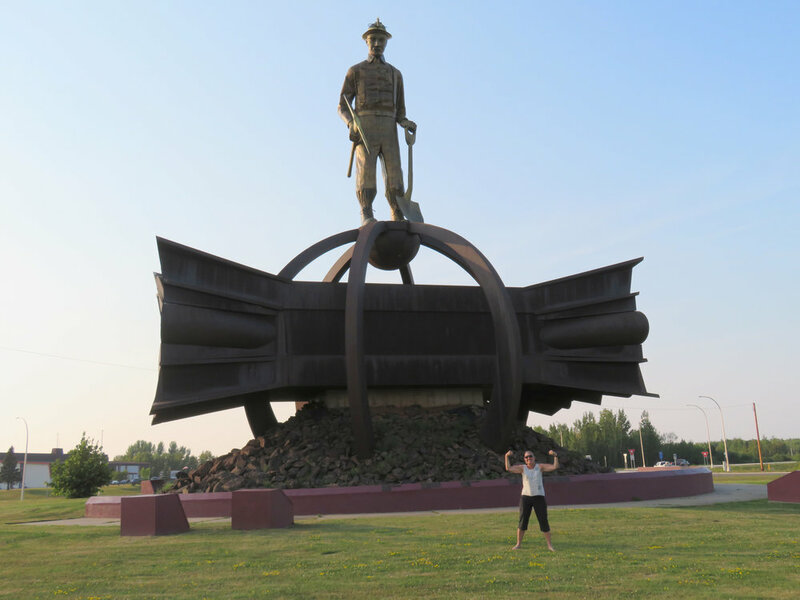 And then there’s the 36’ tall Ironman, erected as a tribute to local miners, that we saw in Chisholm, MN. Beyond ‘big’, Diane & Steve had also mentioned that Bob Dylan’s childhood home was in Hibbing, MN which just happened to be where our campground for the night was located. Yup, right on the corner of Bob Dylan Drive and 7th Avenue, there was Robert Allen Zimmerman’s old house … now occupied by strangers. Bob lives in Malibu now. But wait, there’s more in Hibbing! The Greyhound Bus Museum is also in Hibbing. Who would have guessed that Greyhound had its origins in Hibbing, Minnesota? The museum was unfortunately closed when we arrived, but we did wander the grounds for a few minutes. And if that was not enough, the Hull-Rust-Mahoning Mine in Hibbing, is the largest open pit iron mine in the world. Their observation area was, however, closed for renovation. Darn! The plaque made it all official ... this is the birthplace of Greyhound! We’d had enough excitement for one day and gladly crawled into our bed for a good night’s sleep in Historic North Hibbing Campground ... which, by the way, will be closed next weekend for a Greyhound Bus convention. We have a convention of our own to attend ... the 118th Hobo Convention. Meet you in Britt, Iowa soon!